What most people don’t realize about this blog is that the “running” in the title refers to the actual sport, not just a cute little phrase because of all the cooking that goes on and wanting to shove my face with all of it as soon as possible, although that may be true too. The first year or so of this site, I was running obsessed. I made training plans, I ran races, I told you all about them and then I burned out, found CrossFit and running took a back seat. I didn’t quit it entirely (sometimes there’s nothing better than a no expectations Garmin-less run to clear your head) but it hasn’t been what it used to be to me in quite some time. This year though, I want to change that. 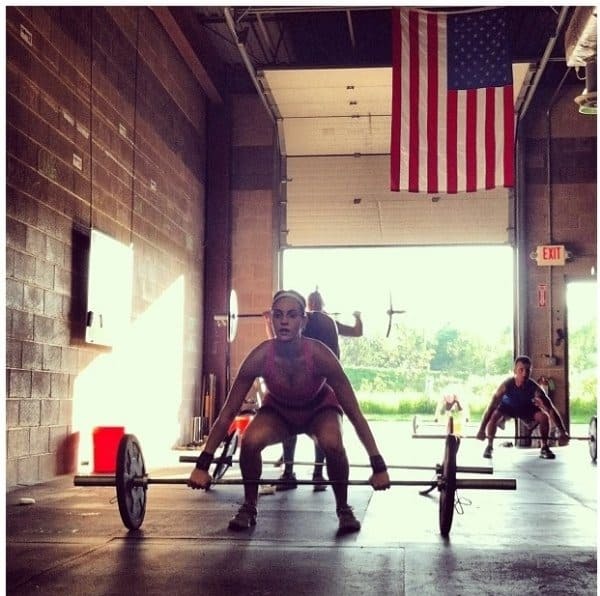 I have goals for CrossFit and while I haven’t yet written them in chalk on the wall like everyone else at my box, a 5 minute Fran and a sub 6 minute Grace are two of them. Last year was spent working up the strength to be able to do both Rx. This year, now that I have the strength, I need the endurance, something that’s visibly waned with my running hiatus. So when the 2+ feet of snow outside finally goes away (it will eventually, right?) I’m getting my run on. I don’t have plans to do any races, just short runs and casual speed work. Whatever it takes for me not to be coughing up a lung for an entire day after Fran shows up on the whiteboard. Want to know what you need for running? One thing, shoes. Considering mine which are big, bulky and super supportive have seen a few too many miles, I was pretty psyched to test out the new Reebok ZQuick running shoe. First of all, how awesome of a color are they? They’re actually even brighter in person than this picture shows. I didn’t think I could get behind the “neon all the things” trend that has taken over footwear in the last year or so, but I’m kinda digging these, not gonna lie. There’ll be no missing me on the bike trail this spring! What I really love about these shoes though is how light they are. 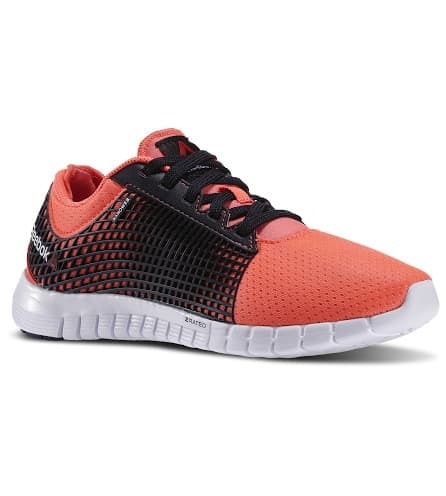 I’ve been doing the bulky, supportive running shoe since I started and this is a nice change up. They’re flexible, breathable and while I wouldn’t necessarily call them minimalist, they’re a lot “less” of a shoe (in a good way!) compared to what I’m used to while still feeling secure and supportive. The shoes are inspired by hi-performance, Z-rated tires to provide good control, traction and make you “unnaturally quick”. Unfortunately, the treadmill (which is the only safe place to run right now in the middle of this snow-packed February we’ve had) isn’t the best testing ground for that but I’m hopeful this “unnaturally quick” thing holds true come spring. I wouldn’t mind some help in the speed department. This video talks all about the innovation behind the ZQuicks from Reebok’s head of running, Bill McInnis, who I actually got to meet and run with last May at a Reebok event in NYC. He’s a cool dude. So here’s to pounding out some miles and smashing some goals in 2014. I hadn’t even considered the “running” in the title in terms of actual running…I sometimes miss the obvious! I haven’t been running much myself either, I found it just led to too many injuries. I find weight training much more rewarding both physically and psychologically. That said once the sun comes back out and the torrential rain stops I might just take to the pavement myself! I love this post. Three cheers for running and the shoes look great, too! Would love to hear more about your running (and Crossfit!) adventures come spring! I have been running for over 20 years. I try not to make it a second job. I do a couple races/year, but since they’re half marathons, I don’t take my training too seriously! This year I incorporated crossfit into my regimen. One day/week I work with a trainer at the local CF box. I’m amazed at how much this HIT has helped my running! Can’t wait to hear how you fare this spring. Great review. I’m a runner at heart! I envy your crossfit which has been on my to-try list since last year. Great Post! I’ve had great luck with the sprints, awesome power lifting shoes, and the only thing I’ll take to the gym. Great Post! I had great luck with the sprints, awesome powerlifting shoes, and the only thing I’ll take to the gym.